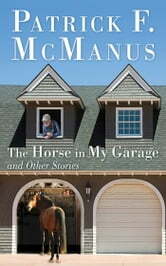 *The Horse in My Garage and Other Stories *is a hilarious addition to Patrick F. McManus’s existing work in humor. The author weighs in on his childhood, everyday life, and outdoor tales with his typical exaggerated commentary that will elicit a belly laugh from all types of readers. Read about the antics of Patrick’s friends Rancid Crabtree and Retch Sweeney in such stories as “Shaping Up for the Hunt” and “Bear Hunters.” McManus plays off the recent obsession with hoarders in his surprising story “The Lady Who Kept Things.” In the titular story, meet Patrick’s horse, Huckleberry, and enjoy the experience of all the problems that come along with owning your own horse—or keeping him in the garage. So pull up a chair, sit back, and enjoy laughing to the hilarious adventures of Patrick F. McManus in The Horse in My Garage and Other Stories.